On Saturday, the House Committees released the 235-page transcript from Comey’s closed-door interview that was conducted on Friday. The Committee on the House Judiciary joint with the Committee on Government Reform and Oversight interviewed fired FBI Director James Comey Friday in a closed-door session that was NOT UNDER OATH according to the transcript. Comey was defiant in his interview with GOP lawmakers and said he “didn’t remember” 71 times, “didn’t know” 166 times and said “I don’t recall” 8 times. The fired FBI boss did admit to a few things, however. James Comey told lawmakers that former FBI lawyer Lisa Page helped her lover, Peter Strzok draft Hillary Clinton’s exoneration statement. Mr. Gowdy. Lisa Page, she was an attorney with the FBI in 2016. Is that right? Mr. Comey. Lisa Page, yes, that is correct. Lisa Page was an attorney I think before 2016, but certainly during 2016 assigned to the Office of General Counsel. Mr. Gowdy. What role did she have with the Clinton Espionage Act investigation? Mr. Comey. Lisa Page’s role in the investigation into whether Hillary Clinton had mishandled classified information was in her capacity as a lawyer assigned to support the Deputy Director of the FBI, Andrew McCabe. Mr. Gowdy. Did she assist you in drafting or editing your July 5th press statement? Mr. Comey. I believe she did assist in drafting — or editing the statement of July 2016. Mr. Gowdy. So, from January 2016 up until your July 5th press statement, it is fair to say that both Special Agent Peter Strzok and FBI Attorney Lisa Page were working on the Clinton Espionage Act or mishandling of classified information investigation? Peter Strzok said during his congressional testimony in July of this year that he didn’t recall changing Hillary Clinton’s exoneration statement on his computer, but conceded the metadata indicated the change was made from his computer. Strzok said a handful of people helped him with the exoneration statement, including FBI lawyers, but didn’t disclose Lisa Page’s name, the Washington Examiner reported. “My recollection, sir, is that somebody within our office of general counsel did, it was one of the attorneys, I don’t remember which one,” Peter Strzok said. “It was a legal issue that one of the attorneys brought up. 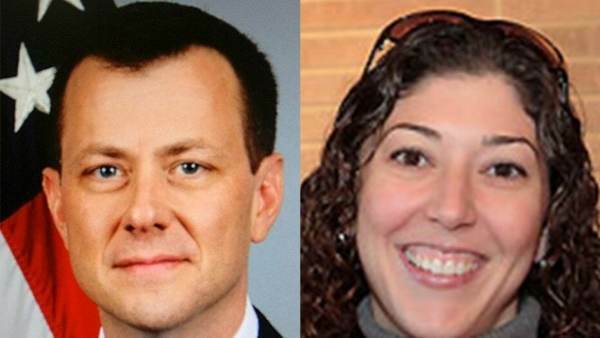 So Peter Strzok couldn’t remember that his lover Lisa Page was one of the FBI attorneys who helped him soften the wording on Hillary’s exoneration statement even though the two were texting each other nonstop about how much they hated Donald Trump and desperately wanted Hillary Clinton to become president. A text exchange between Peter Strzok and Lisa page just days before Comey’s July 5th presser exonerating Hillary proves that Lisa Page knew no charges would be brought against Hillary Clinton – now we know she was actively involved in changing the wording to exonerate Hillary. “Timing looks like hell,” Strzok texted Page on July 1st referring to Loretta Lynch’s decision to accept Comey’s conclusion of the Clinton email investigation just days after the infamous tarmac meeting with Bill Clinton.